Ne w Orleans We had rented a 15-passenger van equipped with a 5-speed transmission, thankfully, and powered by diesel which actually meant that we were hardly able to climb the constant mountain ridges in Tegucigalpa and past that to Marcala where we were to visit our friends the women coffee growers of COMUCAP. We had stopped to fill up at a gas station not far from the small airport that serves the capitol city. I had finished the fill up, herded our delegation into the small van, and was preparing to scoot forward 30 yards or so to see if we couldn’t put some air in the right front tire. Instead I simply sat there, engine idling, and stared, confronted by a sight that seemed more out of the paranoid imagination of Hollywood and bad screaming dreams in the night, than the banal reality of the day. There was no denying that I was transfixed and staring silently at more than a half-dozen men crammed into a white Frontier pickup with machine guns and black ski masks over pulled tightly over their heads in the sweltering heat. They were in a desperate hurry. They were shouting to each other while jumping in and out of the back of the truck. Their front right tire needed the same attention that ours did, and they were sprinting around the truck to solve the problem. Who could they be? What could they be doing? It was 11:30 AM in the morning on a major road in a developing suburb near the airport. There seemed no doubt that lives were at stake. I wanted to believe at first that they might be police, perhaps some kind of SWAT team for the city or federal government perhaps routing out drug dealers or gangsters, which might explain the masks. Nothing explained the lack of insignia anywhere on their uniforms. The Honduran license plate is easy to recognize on the back of vehicles throughout the country. It was even easier to recognize the fact that this pickup had no license plate on it whatsoever. Whatever was going on here was bad, black box, and likely to end in blood. I felt reckless snapping off a picture with my digital camera. I wanted one badly because I could not believe what I was seeing, but at the same time my mind was racing with the internal debate of whether or not I was endangering our team, since if my camera was seen, the retaliation seemed inevitable, swift, and sharp. They finally sped off, and we pulled over, aired up and never talked about it again, but it the experience was searing, and the lone, distant picture haunts me. When returning to Tegucigalpa the following afternoon and touring the bulldozed homes of long time residents being evicted at the hands of the golpistas despite the titles they waved, I found myself shouting at the security guard with his sawed off shotgun and ignoring his recriminations to us and the residents that we could not proceed. The next day when leaders reported harassment by security guards and soldiers and one of our leaders told of a death threat, we were ready to do something, and were almost surprised that our members did not demand that we drop everything and go to the police while calling for the press. They wanted to consult others, including human rights advocates first. They did not believe anyone would care. We respected their reserve condifent that they knew we would stand with them if they were to call, but as an organizer, I thought that we were seeing and hearing something dangerous and fundamental. All of this was unsettling to us, but after two years of crisis, coupes, and conflict the political culture had clearly become inured to violence. What struck me as exceptional had somehow become routine and predictable to our members and organizers. The paramilitaries using violence and terror to maintain control past the charade of elections and the pretense of democratic governance , might still have ski masks but they pulled them on and off and clearly no longer felt the need for dark nights and side streets. 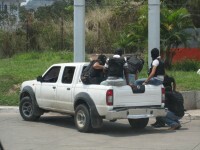 Our members at Mazanales had predicted that the police would react. They were exhilarated by our visit, but certain of the reaction. We wanted to believe they were wrong, but they knew their future better than we did. What was our responsible course? As organizers believing in collective action our core belief has to be that nothing can be stopped without standing up. We were learning lessons in the different calculus of risk assessment between Canada, the USA, and many other countries that did not work in Honduras and other oppressive and unstable regimes. Once violence has infused the political culture and become almost banal in its certainty, it loses its ability to surprise, but not the awesome consequences of its implementation. Violence changes the dynamics of organizing, even as it makes organizing, collective action, and mass resistance even more necessary and, indeed, urgent. This entry was posted in ACORN International and tagged COMUCAP, Manzanales, Violence by wade. Bookmark the permalink. Awfully thankful that everything turned out OK for you. As your presence grows, so will your opposers I guess. Desperation for change can make for strange bedfellows.